Who needs a 15.6-inch convertible laptop? Not everyone, but there must be a good few potential buyers given this isn't HP's first go at the design. And that's the rub of it, really: we think the 13-inch Spectre x360, which out in 2015, is the more logical buy in this category. Convertible laptops are multiplying. It's like they've grown reproductive organs and formed their own tribe. But that means there's something to suit every scale, level of productivity and price point. The HP Envy x360 isn't a brand new model. HP been making oversize convertibles under this name since 2014. But for 2016 the x360 is back to assert itself as the pack leader of 15-inch hybrids. It'll cost you at least £779, though. The version we're reviewing here is £949. It's not exactly cheap, then, but it's nowhere near the slightly terrifying £1,299 HP Spectre 13 (a laptop that, admittedly, is a lot better looking). Most of you will know the drill by now. Convertible laptops like this have screen hinges that don't just stop dead at 135-degrees like most laptops. They carry on until the back of the screen meets the keyboard's keys, and can sit at angle. It's the laptop equivalent of one of those infuriatingly fit and flexible people who can do the splits while standing up. Flexi-hinges like this are more common nowadays, but we tend to see them in smaller laptops than the HP Envy x360. A bit of touchscreen-based tablet flavour makes sense in 11-inch and 13-inch laptops, but do you really want it in a 15.6-inch one like this? 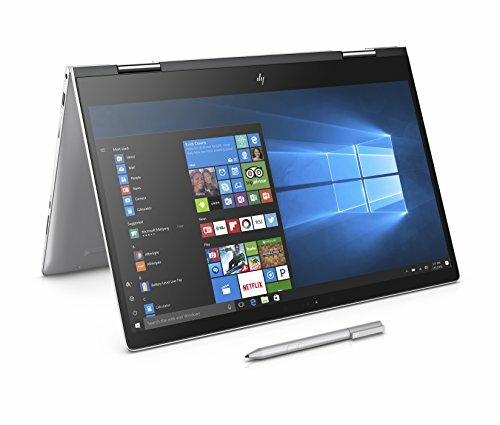 The first issue is that the HP Envy x360 isn't strictly portable. It's slim and light for a 15.6-inch laptop - at 2.17kg and 18mm thick - but if you want something to take around with you every day, this isn't what we'd recommend. A 12-inch or 13.3-inch laptop would offer a better compromise between comfort and size/weight. Given we wouldn't use one of these on the road, we have to think of some at-home uses for the flexi-hinge. Fair enough, there are a few. You might want to play Delia Smith 2.0 with the laptop propped-up in the kitchen, displaying a recipe. Or hitch the laptop up next to you in bed, working your way, episode-by-episode, into a Netflix-induced insomnia. They're all believable, but make sure you actually want to use some of those situations, or you might was well buy the cheap non-convertible HP Envy 15. This Envy family is where you'll find HP's laptops that are neither ultra-cheap nor super-expensive. If you want those, look as the Spectre and Pavilion series. Envy is a comfy middle ground where a lot of self-respecting laptop buyers live. The HP Envy 360 has an all-aluminium shell, which feels great and looks like an HP take on a 15-inch MacBook Pro, AKA the forgotten big brother of the MacBook family. Where Apple hasn't really updated the design of its 15-inch MacBook Pro or Air lines in an age, the HP Envy 360 feels modern. It's light-ish, slim-ish and doesn't have an optical drive. But who needs one of those? It also has a USB-C port, which most laptop-makers now bung into their mid-range laptops as a nod to the future order. Full-size USB ports are going to slowly become relics of the past. It'll take a good long while, though. Other than that you get two normal USB 3.0 ports, a full-size HDMI and a full-size SD card slot. This is a pretty minimal complement for a 15-inch laptop, but the Envy x360 is ready to be plugged into a monitor, or paired with a keyboard and mouse if you like. Of course, with a 15.6-inch screen of its own maybe you won't need to. The Envy x360 has a classic modern mid-range laptop screen: a glossy, glass-topped touch display with an LCD IPS panel. It looks the part and has the viewing angles any self-respecting convertible needs. Look closer and you can see a few little niggles, though. The HP Envy 360's display colours aren't the most potent. It's just unable to display the deepest red and blues, and screen pixellation is pretty clear. This is an issue with 15.6-inch laptops as a whole, not just the Envy x360. While laptop-makers have loads of affordable, high-res 11-inch and 13-inch screen panels to choose from, 15.6-inch ones just don't seem to come in the same array of resolutions. It'll be a while before we see a 4K-screen laptop at this sort of price. The screen also doesn't quite go bright enough to work outdoors on a sunny day, but you'd look a bit silly out in the park with a 15.6-inch laptop anyway. The HP Envy x360 feels more like the kind of laptop you'd plonk on a table and do a bit of work with. It has the right kind of full-size keyboard for the job, and even packs in a NUM pad thanks to the extra space the large screen affords. There's a keyboard backlight too. It's a decent keyboard, although not really any deeper than that of a smaller, thinner laptop. The HP Envy 360 also has a massive trackpad. HP has a thing for really wide pads. A bit of a strange kink, perhaps, but it does give your fingers loads of room to play with. Its button placement is much more intuitive than your average large laptop, keeping the right button to just the bottom-right corner so you don't end up accidentally clicking it all the time. The one niggle with the trackpad is that its surface doesn't feel entirely smooth as you move your finger back and forth across it. This is because it's plastic. The fanciest laptops use frosted glass. Annoyingly, the cheaper Envy 15's pad feels better. HP has tried to make this pad look like a glass one, but get your fingers involved and you can tell it's not one. HP sent us the very top-end version of the HP Envy 360. It costs £949 and has an Intel Core i7-6550U with 8GB RAM. Not only is this a high-end processor among dual-core Intel chipsets, it also has Iris graphics rather than the standard, slower Intel HD 520 chipset. This doesn't turn the HP Envy x360 into an amazing gaming machine, but does mean you have a much better chance of making some games playable if you fiddle around with the graphics settings a bit. Still: don't buy this if you're after a true gaming machine. The HP Envy x360 is versatile performance-wise, but it actually uses the same family of CPU you might find in a super-skinny 11-inch or 13-inch laptop. HP only makes this model with dual-core processors, and if you're after a workstation-style machine, you'll want one with a quad-core i7. We're not saying that the Envy 360 can't do certain things, though. It's powerful enough to use Photoshop, to edit video, all of that jazz. Dual-core laptops like this just aren't quite on-par with a desktop PC though. Day-to-day performance is, though. The single spec benefit of the Envy x360's larger footprint is that it can fit in both an SSD and a hard drive. This is the best solution for people who don't have thousands of pounds to spend on a laptop. You put Windows OS and any performance critical apps onto the 128GB SSD, then dump all your music and video on the much slower 1TB hard drive. Compared with what you get in a MacBook, the HP's SSD is actually quite slow, but it's fast enough to give Windows 10 the SSD zip we're after. If you're not bothered about a slim and attractive frame, for this price you can get a much more powerful laptop. But in return, you get much better battery life. A super-powered quad-core laptop will generally last around four to four and a half hours between charges, but HP says the Envy 360 lasts for up to 10 hours. That's a bit of an ambitious claim. In our experience it'll last for about seven hours of light use before you have to find a plug socket. That's not world-beating, but certainly a lot longer than your average 15.6-inch laptop. The HP Envy 15 is a strange mix of old and new laptop DNA. And most of it makes sense. One very welcome nu-school tweak is that this laptop has really pretty beefy-sounding, loud speakers. They don't bloom out of the sides of the laptop like the best laptop and tablets speakers do, but they are punchy. Who needs a 15.6-inch convertible laptop? Not everyone, but there must be a good few potential buyers given this isn't HP's first go at the design. What you need to bear in mind, though, is that aside from a bonus HDD, this is a blown-up take on the more common smaller hybrids. It doesn't have desktop-grade power and, while the screen quality is decent, colour isn't as punchy as the kind of 13-inch laptop you might buy at the price. And that's the rub of it, really: we think the 13-inch Spectre x360, which out in 2015, is the more logical buy in this category. We're glad HP is making this sort of laptop, even though it won't suit all. What the Envy x360 excels at is something quite simple: being a home-based laptop that looks nice and isn't super-heavy.